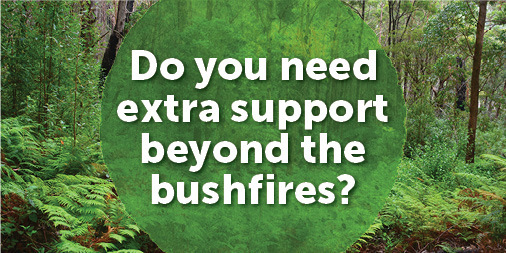 The Bushfires of 2009 Community Support Committee has formed in response to the approach of the 10th anniversary of the February 2009 bushfires. 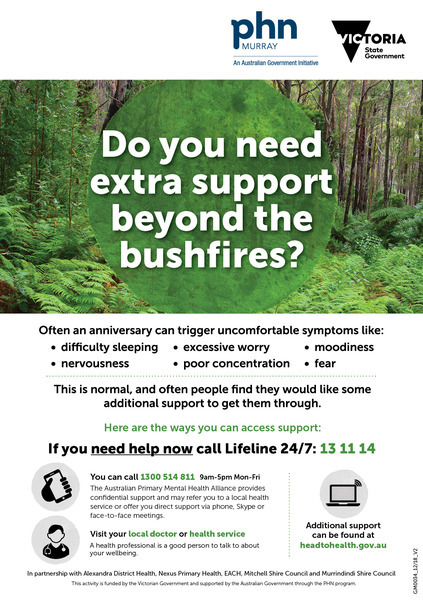 The project has been funded by the Department of Health and Human Services in response to the possible need for increased community-based mental health, medical support and community capacity building – in Mitchell, Murrindindi, Yarra Ranges, Whittlesea and Nillumbik regions – in the lead up to, during, as well as after the commemorations of the 2009 bushfires. Many members of the committee were directly involved in the initial response to communities impacted by the bushfires of February 2009. The committee is building on collective experience from Murray PHN, Department of Health and Human Services, Lower Hume Primary Care Partnership, Eastern Melbourne PHN, Australian Primary Mental Health Alliance (APMHA), Nexus Primary Health, Mitchell Shire, Murrindindi Shire, Alexandra District Health and GV Health. Community members needing assistance are encouraged to speak with their local health professional. Alternatively, they can call the Australian Primary Mental Health Alliance (APMHA) on 1300 514 811 (9am-5pm Mon-Fri). APMHA have experience in the original 2009 bushfire response. 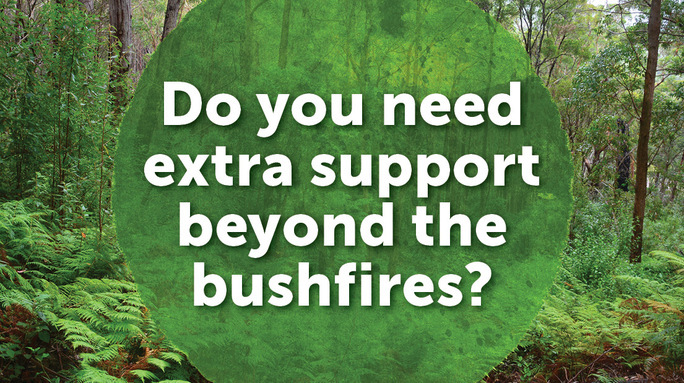 The University of Melbourne is completing a 10-year study ‘BeyondBushfires’ working to understand how people and communities are getting by after the February 2009 fires and what helps them through this process. Visit their website or Facebook page. GPs can trial the Royal Australian College of General Practitioners (RACGP) online emergency response planning tool (ERPT). For information click here. Click here for a collection of resources and information, including how to get in contact with community members who have expressed interest in being available for interview. Credit to our colleagues at Lower Hume Primary Care Partnership for resources and up to date information. Stay informed and join the OEHCSA Newsletter.